Its odor is unmistakable. It is a staple of cooking everywhere. And for decades it has been the subject of medical testing. Aside from being tasty, how much can garlic do for our health? A new study in London has discovered that women who consume a diet high in garlic (and other “allium” vegetables such as onions and leeks) tend to have lower levels of hip osteoarthritis. That is one of the most common forms of joint pain in the world. 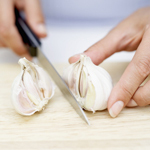 Published in “BMC Musculoskeletal Disorders,” the study not only highlights the possible effects of food in preventing osteoarthritis, but also shows the potential for using compounds found in garlic to develop treatments for the condition. Something in garlic could work against arthritis. Osteoarthritis is the most common form of arthritis in adults. Women are more likely to develop it than men. It causes pain and disability by affecting the hip, knees and spine in the middle-aged and elderly populations. There are no great treatments for it, and alternative medicine plays a fairly significant role in prevention and reducing symptoms. The study looked at over 1,000 healthy female twins, with no symptoms of arthritis. Tracking their diets and analyzing X-rays, they could see any signs of early osteoarthritis in their hips, knees and spine. Those women who consumed a healthy diet with a high intake of fruit and vegetables, particularly types of allium such as garlic, had less evidence of early osteoarthritis in the hip. Taking this one step further, the researchers examined garlic itself. They found a compound called “diallyl disulphide” that appears to reduce the amount of cartilage-damaging enzymes. While it’s unclear if eating garlic will boost the amount of this compound in the joint, the study at least points to possible ways to treat and prevent hip osteoarthritis. But still, the results indicate that the more allium vegetables you eat, the greater your protection seems to be against osteoarthritis. One hint on getting the maximum effect from garlic: crush it before you put it in food, so its most healthful components can be released. For a long time, garlic has been believed to be heart-healthy; now we know it may be great for our joints, too.